A lot of people have asked how much we spent on the wedding. In total, the final cost ended up being about $8,000. Every time I think about that, I am so proud. I will be honest guys, I did NOT think we could make our budget. Gman is really good with finances and finding work arounds to things and I followed his lead and not willingly at first. But as I look back on our big day, I am so so glad he challenged us to stick within the budget. After all, a wedding day comes and goes, but managing money smartly last forever. As I’ve mentioned in previous posts, Gedalya and I could not be happier with Wedgewood Wedding Banquet here in Henderson. The coordinators did a fantastic job with everything. From all the plans we presented, to making sure all the loose ends we forgot about were tied, to making sure we had a stress free night, I couldn’t have expected anything more. What I loved most about them was that they only required a $4,000 minimum, which we made. We ended up getting their first package called the Crystal Package. It included 1 entree for a buffet with a choice of a carving station or chicken entree and 8 salads, a DJ & MC services, invitations (but we ended up opting out of this and creating a wedding website for our invitations), toasting flutes (but we brought our own) and house champagne for the toasts. Some add-ons we added were draping for the reception, a vegetable and cheese crudités for our guests. The details of the wedding was what stressed me out the most. 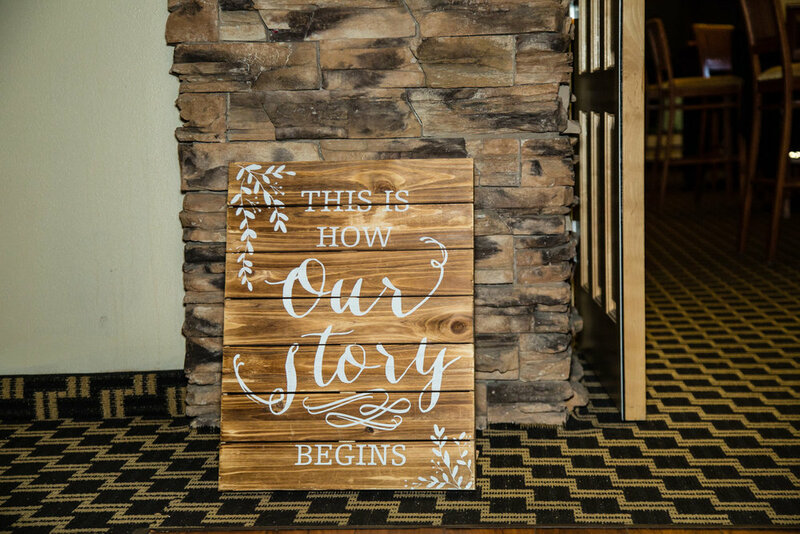 I picked so many ideas on Pinterest of what I wanted to do, but I ended up scaling back on a lot of things I wanted to do because the venue was pretty much decorated on it’s own. Our package included colored napkins and table cloths, so we were able to pick ones that matched our color scheme. 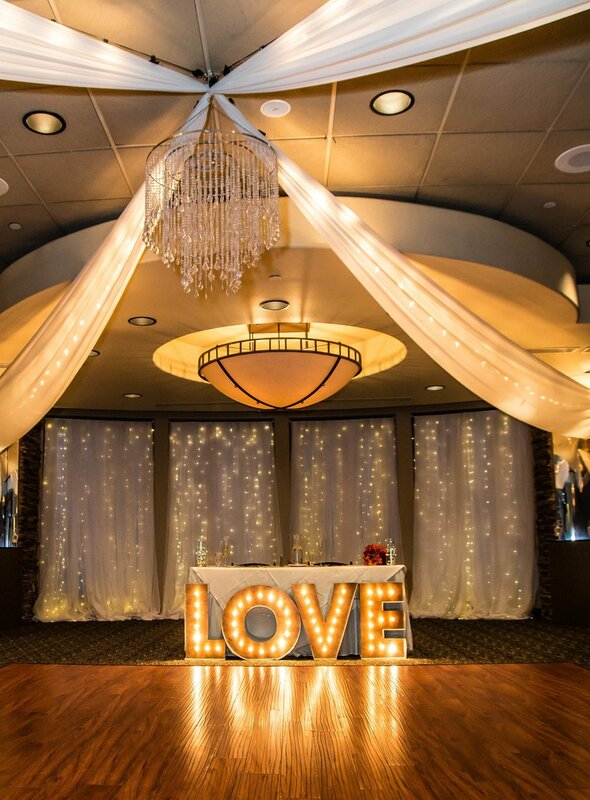 The venue also provided cute signs for the wedding, including the gorgeous “LOVE” sign that stood in front of our couples table at the reception. 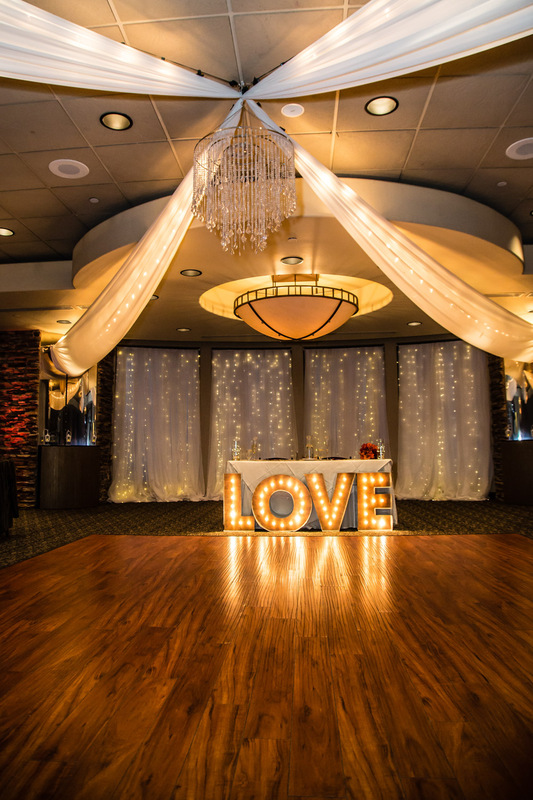 Also, string lights were already hanging from the ceiling of the reception room, so we just added a draping fee to our cost and it really made the room a lot more elegant. Centerpiece decorations - During all the madness of trying to plan the wedding, I had some really great people wanting to help as best as they can. For example, I had a friend who was kind enough to give me tall clear vases to use as part of our centerpieces. To fill those vases, Gedalya and I went to the Dollar Store to buy fall bouquets and creating 8 to 10 bouquets to fill the vases. I ended up wrapping fairy lights around the stems of the bouquet to add some sparkle to the table. The actual center piece holders were cake holders created to look like slabs of wood. We actually received these from a vendor that works with Wedgewood Wedding Banquet. 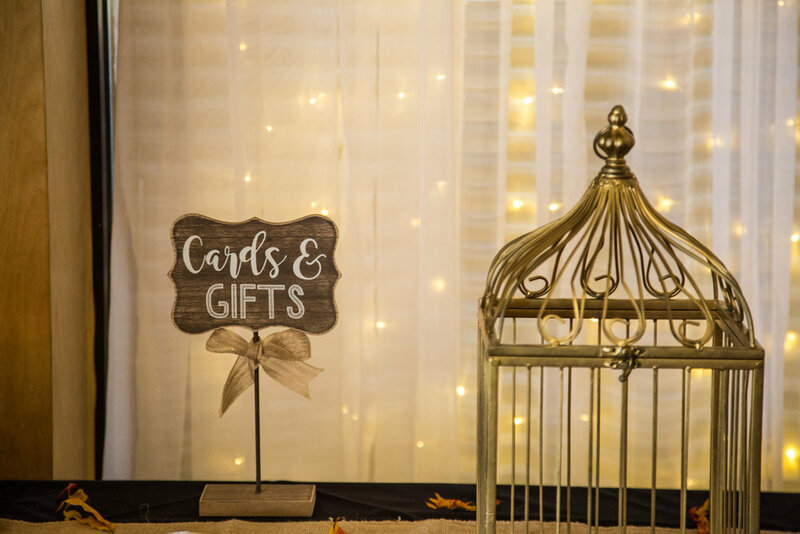 When you become a Wedgewood couple, you receive a $250 credit that can go towards last minute detail for decorations that are sold on this portal by different vendors. We ended up getting a really great deal on 8 of them, one for every table. Ceremony aisle decorations - I originally was going to buy fake leaves, but the venue wouldn’t allow it due to them being potential choking hazards to the animals on the golf course. After searching the net, we found dried REAL fall leaves for sale and we ended up buying about 3 bulks to sprinkle down our ceremony aisle for about $50. I also bought a pack of 20 lanterns with electric candles to place on the sides of the aisles. 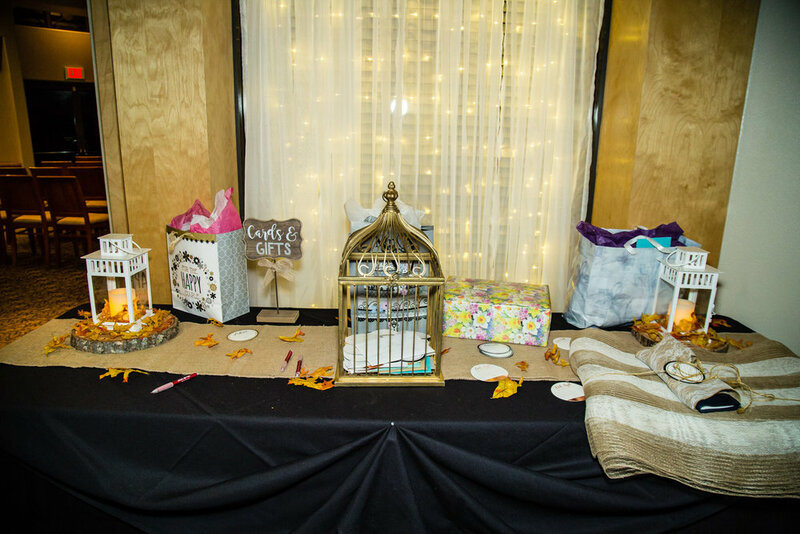 I thought the lanterns and the leaves were a great combination as we were going for a more elegant fall theme. My bouquet - I ended up spending time at the clearance aisle at Michael’s put together an artificial fall bouquet for $15. I wrapped the stems with brown gift wrap string that I found for $1 at Target. The boutonnieres and corsages - We went back and forth with buying real or fake flowers, it was starting to drive me batty. First, we looked at Costco and Sam’s Club and they offered pretty great deals, but we still would have been over budget if we bought them. We ended up getting a really cool pack of artificial flowers for the boutonnieres and corsages and they were super cheap. When they arrived, I was actually surprised at the quality of them. So instead we paid $9.99 each for a set of corsages and boutonnieres, giving us a total of about $90, versus $180 if we had bought real flowers elsewhere. Photo hashtag cards - At Michael’s, I found a pack of 24 Dave Tutera photo tent hashtag cards for $10 to sprinkles all around the venue for our guests. We went with our usual hashtag of "GandGWedding” on Instagram along with “GandGAdventures”. Drink coaster advice and greeting cards- Also at Michael’s, we bought a pack of 25 coaster cards that guests could fill out for $7 a pack. There were different packs such as “Advice”, “Best Wishes”, and “Date Night Ideas”. Gman and I had so much fun reading them during our mini moon and loved what our friends and family wrote to us. They are great keepsakes for the wedding. Wedding rings boxes for our ring bearers- I wanted to create something unique for my ring bearers, so I found slabs of wood in the shape of hearts and wooden jewelry boxes. I used strong tacky glue to place the jewelry box in the center of the heart shaped wood. To add a little something to the box, I also glued flowers to the top of each box. The rings were placed inside each box and my ring bearers each carried one of our rings down the aisle. Seating chart - Gman created the seating chart for our guests (of course). He worked with the venue to make sure the layout was reflected in the seating chart so everyone knew where they were sitting. After designing it, he printed it out on a poster board at Staples for a fair cost. Cake topper - I found a “Love” cute cake topper from Amazon for $6. It comes as a paper with string and is very easy to put together. 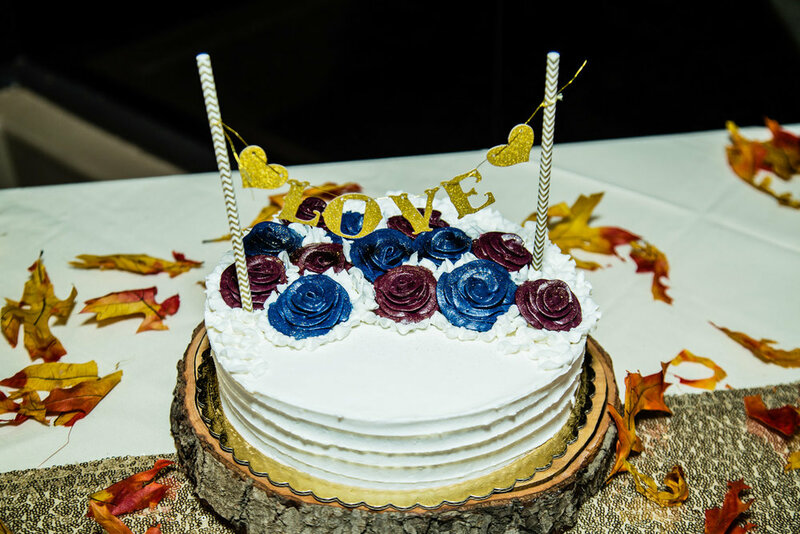 It was such a great piece to add to our cake! Desserts - Gman and I wanted a dessert table so everyone could enjoy more options than just cake. Since we were on a budget, we ended up buying multiple pastries from Smith’s and they had it ready for us the day before the wedding for pick-up. Sparklers - I wanted to do a final sparklers shot at the end of the of the celebrations (mostly for picture purposes). We ended up getting a few for just 1 round of a sparklers send off because they went out fairly quickly. Thanks to our photographer, Ben Sahagun, he was able to capture a couple shots from the sparkler send off. Do you have any tips on how you stayed on budget with your wedding? Share them in the comments below! Graciella Krycer is a writer based in Las Vegas, NV. Like most bloggers, she created DizzySpangle.com as an outlet to express her passions of faith, fashion, food and lifestyle. Currently, her main focus is to inspire others to find their inner light through inspirational posts based on her faith life. She enjoys spending time with her husband & friends, finding inspiration in every day life and car karaoke. Learn 13 more facts about her here!